Greater clarity and calm, but also more energy and inspiration, is what people often say they achieve by using Nadi Shodana (alternate nostril breathing). But can this be measured scientifically? In the brain, a continual rhythmic electrical activity is taking place, the so-called brain waves. Taking measurements from electrodes, which are placed on the scalp, is called electroencephalography (EEG). There are four types of brain waves. During deep sleep, delta waves are predominant (1-4 oscillations per second), and in a dozy, dreamy state theta waves (4-8 oscillations per sec.) dominate. The brain waves that interest us the most are the alpha waves (8-13 oscillations per sec.). They are mostly to be found when the person has closed eyes, is mentally relaxed, but still awake and able to experience. When the eyes are opened, or the person is distracted in some other way, the alpha waves are weakened, and there is an increase of the faster beta waves (13-40 oscillations per sec. ), that is, the brain is activated. The amount of alpha waves therefore shows to what degree the brain is in a state of relaxed awareness. When the beta waves are predominant, we, to a great extent, think and act habitually. Alpha waves, on the other hand, show that the brain is in a more open and creative state, with a better contact with the emotions and the subconscious. Scientific studies have shown that the amount of alpha waves increases during meditation, and there is a lot to suggest that people who meditate have more alpha waves than normal. The left brain half is verbal, analytical and logical in its functioning, while the right is musical, emotional and spatially perceptive. The left brain hemisphere thinks in words and concepts, and the right thinks in pictures, feelings and perceptions. In a normal brain, a spontaneous shift in balance occurs between left and right, depending on what one is doing. When one is reading, writing and speaking, the left half will be more active than the right. On the other hand, when one is listening to music or is engaged in visual spatial perception, then the right half is most active. It is important for the creative activity of the individual to have a “correct” balance and communication between the brain halves. By calculating the ratio between the amount of alpha waves in the right and left brain hemispheres, an expression for the balance between the brain halves is obtained, the so-called R/L ratio. If there is exactly the same amount of alpha waves in the right and left brain hemispheres, the R/L ratio will be 1.00. If there is more alpha in the right brain half, the R/L ratio will be more than 1.00, and vice versa, the R/L ratio will be less than 1.00 if there is more alpha in the left brain half. In most people, during rest with closed eyes, the R/L ratio is normally slightly above 1.00. This is probably due to our culture’s emphasis on the functions of the left brain half. During deep relaxation, however, a balance of 1.00 between the brain halves is approached. Previous studies (see, amongst others, the articles Lasting and deep-reaching effects and Mapping the brains activity after Kriya Yoga) point towards that the ideal temporal R/L ratio should be around 1.10, and the post temporal around 1.15. The American scientist, Richard Davidson, has, in recent comprehensive studies, found that depressed patients had an R/L ratio in the temporal lobes permanently under 1.00, whereas out-going, optimistic people had an R/L ratio over 1.00. With children of the age of 2-3, he discovered an R/L ratio under 1.00 in a group of shy and inhibited children, while another group of outgoing, uninhibited children displayed a R/L ratio over 1.00. The purpose of this study was to test the hypothesis that the breathing exercise Nadi Shodana improves the balance between the two brain halves as reflected by the alpha R/L ratio. The alternate nostril breathing ( Nadi Shodana) is a yogic breathing exercise. It is performed in the following manner: One inhales through the left nostril (while closing the right), the breath is held (closing both nostrils), thereafter exhaling through the right nostril (closing the left). Then, one inhales through the right nostril, the breath is held, and then exhales through the left nostril. This constitutes one round. For a detailed description of the various steps of Nadi Shodana, see the book Yoga, Tantra and Meditation in Daily Life by Swami Janakananda. 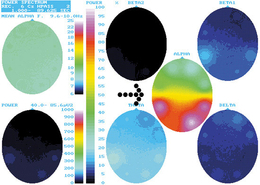 Two groups, of 12 subjects each, had their EEG measured before and after Nadi Shodana. Group A consisted of teachers and students of the Scandinavian Yoga and Meditation School in Copenhagen with many years experience of Nadi Shodana. Group B consisted of students of the school who had just learnt Nadi Shodana. All subjects were right-handed. We avoided left-handed people, who can have a different balance between the brain hemispheres. All subjects performed five rounds of Nadi Shodana as described previously. This took 10 to 15 minutes. The EEG measurement was taken from four electrodes on the left and four on the right side, placed on the head with the aid of an elastic band (see fig. 2). The signals from the electrodes were relayed through an amplifier to a computer, where the eight channels of EEG was displayed on screen. They were simul­taneously stored on the hard disk for future analysis. 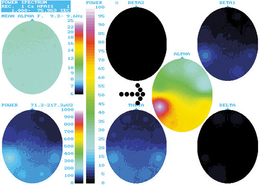 Periods of about 60 seconds EEG recording, one before and one following Nadi Shodana, were analysed for the temporal and post-temporal lobes, which are considered the most important sites to measure this balance. With all subjects in the experienced group, changes occur towards an optimal balance (fig. 1). Five people, who previously exhibited a R/L ratio below 1.00, had a value over 1.00 following Nadi Shodana. And vice versa, five people who had a high R/L ratio before the exercise achieved lower values towards the optimal after the exercise. The mean temporal ratio fell from 1.19 to 1.11, while the post temporal ratio fell from 1.43 to 1.19. These changes are statistically significant and cannot be due to coincidences. Even though most of the changes in the inexperienced group are in the direction towards balance they are not, however, statistically significant. For several of the advanced participators, apart from more alpha waves, there was also an increase of the amount of beta waves after Nadi Shodana. This might seem paradoxical, as such an activation of the brain normally involves a decrease in the amount of alpha waves. This could be interpreted as becoming more active and at the same time remaining calm and clear in the head. We found a similar “paradox” during a previous study where we measured EEG during the deep relaxation Yoga Nidra. Normally, when the amount of theta waves increases, the alpha waves decrease and you fall asleep. During Yoga Nidra, however, the theta waves increased, but the decrease of alpha waves was minimal. This means that you don’t fall asleep, but remain aware and awake also in the deeper state (see Pictures of the brain’s activity during Yoga Nidra). In figure 3, you can see how the amount of alpha waves has increased in the right brain half after Nadi Shodana, and there is an optimal R/L ratio. Previous measurements before and after Kriya Yoga show the same favourable changes as after Nadi Shodana. The average temporal R/L ratio after Kriya Yoga was 1.12 together with a significant rise of alpha waves (see Mapping the brains activity after Kriya Yoga). EEG-measurements of participants on the three month courses (1986-91) showed the same improvement of the R/L ratio. The measurements then, however, were not done in connection to any meditation practice, but during ordinary rest, before and after the course. This result indicated a permanent long-term effect (see the article Lasting and deep-reaching effects). These positive changes were found in all instances in regions of the brain that are closely linked to the limbic system, which is the seat of our emotions. On the basis of our results, we therefore conclude that Nadi Shodana, if it is done regularly over a longer period of time, has a favourable influence on the balance between the brain halves and thereby an emotionally stabilising effect on the individual. A. Five persons in the advanced group, who initially had a R/L ratio below 1.00, after Nadi Shodana exhibited values over 1.00. And conversely, five persons who before the exercise had a high R/L ratio achieved lower values after the exercise. So all persons in this group approached the best possible relation between the brain halves. After Nadi Shodana, everybody in the advanced group came very close to the average value, which means it is statistically significant. B. 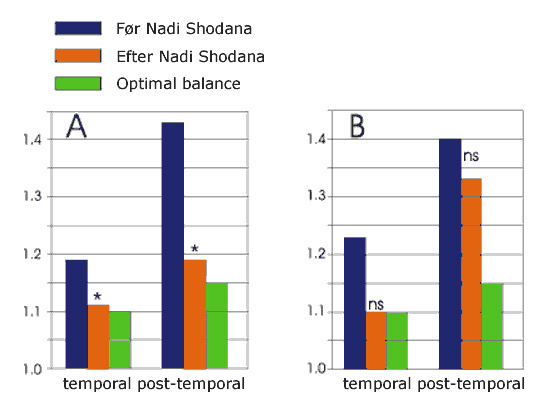 In the inexperienced group, the values after Nadi Shodana showed greater variance between individuals, which entails that this result is not statistically significant (even though their average for the temporal area is the same as the optimal value). * these changes are statistically significant and cannot be ascribed to coincidence. In this study we have used the four points of measurement (T3-T6) on the temporal lobes. The central figures on the pictures (see arrows) show the alpha activity before and after Nadi Shodana. If you compare these you see that after Nadi Shodana the amount of alpha waves in the right brain half has increased (more red), and that the balance between the brain halves has improved. Retreats where Nadi Shodan is taught by experienced teachers.